The Best Air Purifiers for Allergies . If you are like us allergies are one of those things you deal with. You want to feel better. Feel rejuvenated. We get it since we are the same. Keep reading below if you want to learn more about allergies. Learn how to choose an air purifier that will really work for allergies. Quiet - it won't bother your sleep with its light white noise. Top rated HEPA filters produce totally clean air. Long term reliability & unmatched service. Tells you when it's time to check the filters. Lightweight and easy to move. Stylish design with small footprint is great for a bedroom. Tells you when it's time to check the filters and includes remote. HEPA and carbon filtration only – no ionizer or electronic device. Lightweight and easy to move. 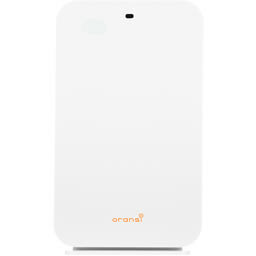 Super Quiet - no air purifier on the market produces so little noise with such a high air flow making Oransi the The Ultimate Air Cleaning Machine. Best Quality - all key components made in USA. MERV17 HEPA filter tested up to 99.99%. Advanced carbon for smoke removal. CA Wildfire Sale - An alternative is our 220V International EJ model on sale at $699. Nearly the same as the EJ120 - requires power converter to run on 120V. "I love it. I have been using the HEPA air cleaner for almost three weeks now and it was the best purchase I ever made. I am super sensitive to smells and have been having a lot of allergy problems. I was willing to try just about anything to make my allergies better. 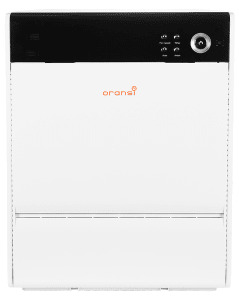 I visited someone who had an Oransi air purifier and checked it out before I purchased. I was very impressed so I went for it. As with most things that work you wished you had done it sooner. I am breathing so much better and feeling much better. I am recommending this air purifier to anyone who mentions having allergy problems. Recommend others buy it? I sure do. Don't hesitate, order now and feel better real soon." "I was a little skeptical at 1st but living in Atlanta and pollen off the charts it's crazy. The 1st day we got the HEPA air purifier we plugged it in and within 30 min my husband's allergies and mine dissipated, we couldn't believe it also the amount of dust, pollen, mold spores and pet dander are nearly non existent. I can't say enough good things about. This air purifier has improved our lives tremendously." "My wife and I are both allergy sufferers and central Oklahoma is one of the top ten places NOT to live if you have allergies. After spending the last year with terrible allergy problems, which caused numerous sinus infections, bronchitis and severe lack of sleep, we decided to take action. 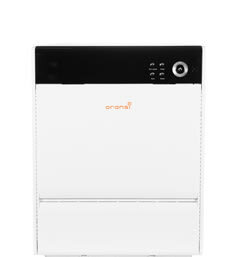 We did some research and found that the Oransi Max HEPA air purifier was the highest rated air purifier on the market. We purchased one and so far have found it to live up to its reputation. We noticed a difference the first day we used it! We have been able to sleep all night without waking up to coughing fits and severe sinus blockage. The air purifier is very portable and we move it from room to room as needed, while working in the kitchen or watching TV in the living room. We particularly enjoy the special features like the variable fan speed and the the timer. I highly recommend this air purifier to anyone who suffers with allergies!" In just 3 simple steps you’ll find the best air purifier for your needs. Growing up in New York I had no allergies as a child. After moving to the South, it only took a few years for me to have an appreciation for what allergy sufferers go through. And after my son suffered with asthma it became clear how allergies can have a huge impact on your health. And how much a good air purification system can help to relieve asthma and allergy symptoms. This was especially true after a bout of exercise-induced asthma and an allergy free haven was invaluable. In this guide we will explain what allergies are and how to find the best air purifier for allergy relief. Sadly, airborne allergens are everywhere. Whether you're indoors or out, you are in contact with allergens. Your allergies are set off by a mix of pollen, dust, pet dander or other pesky particles. 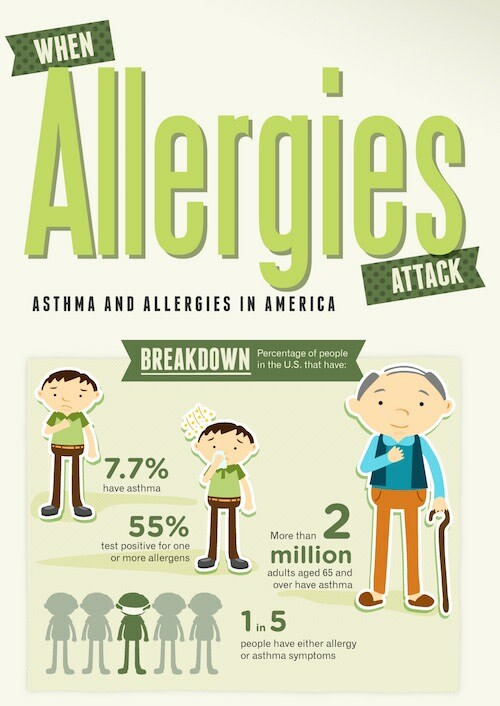 Allergies affect as many as 30 percent of American adults and 50 percent of children. It's no wonder there is a link between allergy and asthma. 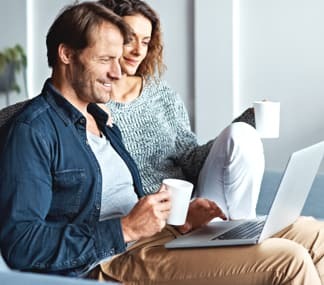 Whether you have mild allergies, are looking for relief in a small bedroom or are more sensitive to allergies and need the best, each of our Air Purifiers for Allergies will provide the relief you are looking for. If you want to know more about us, see how we make better air purifiers. So, what exactly is an allergy? Merriam-Webster defines an allergy this way: “a medical condition that causes someone to become sick after eating, touching, or breathing something that is harmless to most people." In other words, our bodies are protecting us from something that is harmless. It’s like a false alarm. What happens is our immune system produces antibodies to protect us. In the case of a real threat this is vital. In the case of allergies, it is more of a nuisance. And can wreck havoc with your sinuses, skin and respiratory system. For someone with asthma it can be dangerous. In some cases, allergens can even impact your digestive system. A food allergy works the same way. For example, for some people (often children) with a peanut allergy coming into contact with peanuts can be life threatening. There can be an immediate over-reaction that effects the airways that can be serious. What is happening is our bodies produce antibodies to protect the immune system from invaders called antigens. Our bodies are programmed to fight bacteria, viruses and fungi that cause disease or infections. In the case of allergens, our systems think the dust, pollen, pet or whatever is causing the reaction is a threat to our immune system. In fact, this mis-calculation (reaction) can be more of a threat to our well being. For some people the reaction is mild and for others like my asthmatic son it was sometimes an emergency. There are certain risk factors that increase your chances of having allergies. They include whether other family members have allergies, your age as children tend to have more allergies and whether you have allergies. Your chances of having allergies are 33% if one of your parents has allergies. If both are allergic the odds increase to 70%. Often you will know whether you have allergies, especially if you grew up with parents with allergies. It can be a little tricky to determine this on your own because allergies can feel like a cold. Chance are if your symptoms last for an extended period of time (longer than a normal cold) or are worse with high levels of pollen or increased exposure to dust or other triggers then you likely have allergies. What is interesting is that as we move around the country we come into contact with new allergens. This can result in new allergic reactions. Or we may experience allergies for the first time at an older age. We frequently talk with people in their 50’s or 60’s who are now developing allergies for the first time. It's clear that an allergy symptom can appear at any time. Even if you did not have allergies before. The consumer reports from our new customers highlight how we are in a new world as it relates to allergies. To know whether you have allergies a doctor exam may be needed. As part of their evaluation the doctor will want to know your symptoms, any possible triggers and medications you are taking. You may need to get referred to an allergist. They can perform more detailed tests such as a skin or blood test to learn more specifically what is causing the allergies. We find it interesting that different people react with similar symptoms to a variety of triggers. This can be from a mold spore, pet allergy, dust pollen, pet hair, or really any airborne particle. Is an allergy a disease? There is no cure for allergies. It’s more about managing your symptoms through avoiding the allergen, medication or immunotherapy. The most effective way is to avoid the allergens in the first place. This is often accomplished by minimizing your contact with the allergen. This includes changing your clothes when you first come home, washing your face and hair and cleaning the air with a HEPA filter. If you have a pet, then a high quality HEPA vacuum cleaner and a home air filtration system can really reduce the amount of allergens in your home. This is important since we spend most of our time at home. For more ideas check out 19 ways to relieve congestion from allergies. Here are ways to boost your immune system. Many of the people we talk with just want a good night’s sleep and to feel better. So, they use an air purifier in the bedroom to sleep peacefully without being stuffed up since they are resting in a room with few allergens. 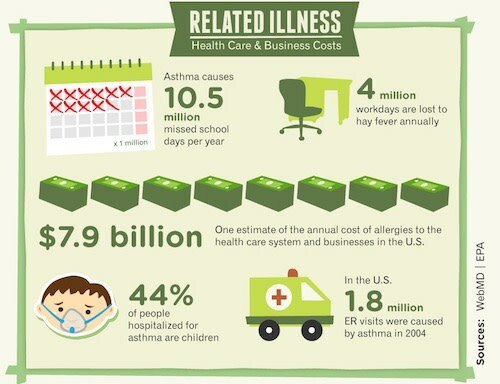 The costs related to allergies is big. Can you get a fever with seasonal allergies? Nope. Even though you may feel terrible and hay fever as the word fever in it, there is no associated fever with allergies. Having a fever is a good way to rule out allergies. What causes allergies in the spring? Spring is a time when trees and grasses release pollen into the air after the winter season. The purpose is to fertilize other plants. However as the dust pollen and pollen grains are in the air they find their way everywhere. In Austin where we are located, the oak trees give off so much pollen in May that cars turn yellow. What causes allergies in the winter? Allergies in the winter are caused by the indoor air allergens. The most common culprits are dust, dust mites, pet dander and mold. We often see this when people first turn on their forced-air heating system and dust and other pollutants are blown throughout the house. Dust mites are everywhere. You cannot avoid them and we wrote this article with 5 proven ways to get rid of dust mites. Most air purifiers are purchased in the winter as homes are often closed up and you are in contact with dust mites and sometimes pets. To learn more about dust removal see our best air purifiers for dust. 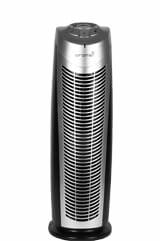 If your issue is related to mold spores then you may want to check out the best air purifiers for mold. What am I allergic to in the fall? Fall allergies are mostly caused by ragweed. Ragweed pollen is often released in August through October. The allergic reaction to fall allergies is sometimes referred to as hay fever. 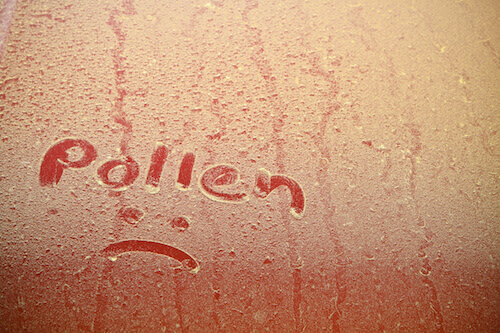 Hay fever is not a fever although it can feel like you have a cold and fever. If you have spring allergies you most likely are allergic to ragweed. Ragweed is common in North America and a member of the daisy family. Austin is a great place. It receives a lot of praise. There is a skeleton in the closet and it is called cedar fever. Since moving here I have learned first hand what this is. There are small Juniper trees throughout central Texas that the locals for some reason refer to as cedar. They are not cedar trees but regardless the pollen they give off in the winter is debilitating to many people. It takes about 3 years to experience the allergic reaction. It is a doozy. Your eyes are itchy and dry, throat is sore and you ache like you have a mild flu. Besides frequently clothes changes and face washing an air purifier is a must. We will wrap up this page with some information on allergies for pets. If you have a dog or cat, it’s obvious they suffer from allergies like we do. You can see the build-up around their eyes. The rubbing of their faces on carpeting. So, many of the same things apply to our pets. We need to keep their environment clean and minimize exposure to the allergens. I know this can be challenging when your dog wants to run around outside and roll in the grass. What we suggest is you keep your pet reasonably clean as they will bring the pollen into your home. 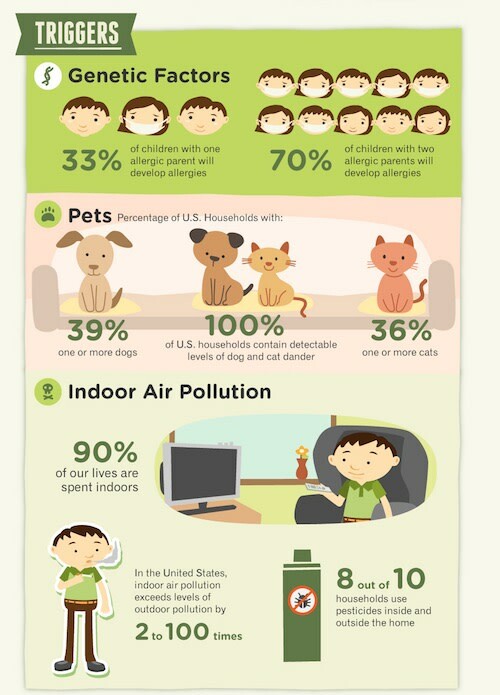 Another allergen that effects us is pet dander. This can be dander from a dog, cat or even a bird. Many of us are allergic to animal dander. It's interesting that a pet allergy can be something we feel from our pet or a reference to our beloved pet who is suffering from allergies like us. To get rid of pet dander and provide relief it is best to have a good vacuum with a HEPA filter to keep the ground clean as well as a HEPA air purifier to keep the air clean. It is the contact with the airborne pet hair and bird dander that will trigger your allergens. So, again an air purifier is a must. What you may not realize is that you don't have to own a pet to have animal dander in your home. It turns out, pet dander travels through the air so if you have a pet owner nearby chances are you have cat dander or similar in your home. Now that you have some background about what allergies are, we will discuss what to look for in air purifier for allergy relief. If you want to remove all of the allergens you obviously need a great filter. This is a good part of what you are paying for. Air purifier filters are referred to in a variety of ways. This includes HEPA filters, HEPA-type filters, true HEPA filters, plus a variety of other names that have HEPA as part of them. If you are looking for allergy relief you will want to go with a true HEPA filter. This has the highest efficiency and does the best job in removing all sizes of airborne particles. A true HEPA filter means it removes at least 99.97% of airborne particles that are 0.3 microns or larger. While technical, there is a better way to compare filters. This would be by looking at the MERV Rating for the filter. Most air purifiers have filters that are rated MERV15 or 16. 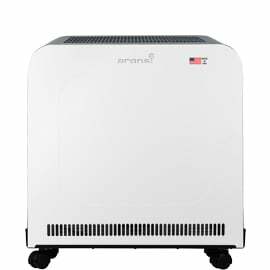 The EJ120 Air Purifier that we make is MERV 17. The Erik room air purifier is MERV 18. A true HEPA air cleaner will remove the most difficult airborne particulates. Meaning the smallest sized particles - those with the smallest since in microns. The other "HEPA" filters like HEPA-type filters do not meet the criteria for being called a HEPA filter. In some cases some brands will call their filters HEPA filters. In this case they are referring to their filters being a pleated filter. As opposed to other technologies such as negative ions, plasmawave technology, electrostatic, air ionisers, uv-c light, etc. The point is to really know what you are getting look for the filter MERV rating. In addition to the HEPA air filter, most room air purifiers also have a pre-filter. In some cases the pre-filter has carbon. If the carbon pre-filter is a foam filter with sprayed on coating of activated carbon the effectiveness will be low. If it is a granular activated carbon pre-filter (which are the carbon pellets), you will get much better odor removal. As we have mentioned in some other articles, to activate carbon it is specially baked. This creates hundreds, and sometimes millions of cracks and crevices that then adsorb a wide variety of odors. Do Air Filters Reduced Dust? Dust is a common allergen and air filters are the best way to remove dust from the air in your home. This may be surprising to you but we see an increase in air purifiers being purchased for dust removal in the winter. In many cases this is due to the heat being turned on and dust that has accumulated in the air ducts is then blown throughout your home. The furnace filter may catch some of the large dust particles however it is not meant to remove the smaller dust particles. To do this effectively you should go with a room air cleaner with a true HEPA filter. This is because the true HEPA filter has the highest efficiency, meaning it can remove more of the smallest of particle sizes. Now that you know the filter basics, let's move on to room coverage. Just having a top notch filter is not enough. You need to circulate the air through the filters to get clean air. With HEPA filtration this can be difficult. It gets even more challenging when you have a large room. The more efficient the filter is, the more difficult it is to move air through it. This is because of the added air flow resistance. Another thing that comes into play is noise level. What we have found is that you can get good air flow to clean a large room in a home provided the filter is larger and you use a better motor. This is precisely how we make our home air purifiers. The industry standard for assessing room coverage is the Clean Air Delivery Rate. This is also known as the CADR or the CADR rating. It is a way to show how much air flow there is through the air purifier. In a sense a filtered air flow. For example, if the fan can move 100 cfm (cubic feet per minute) of air and the filter removes 80% of particles, the CADR would be 80. It's a simple calculation of air flow times the HEPA filter efficiency. A higher CADR rating means the air cleaner can clean a larger area. For example, our EJ120 Air Purifier has a pollen CADR of 384. In comparison it will filter twice as large of an area as an air purifier with a CADR of 192. You will want at least 2 air changes per hour. If your allergies and asthma are serious we suggest at least 4 air changes per hour. If your ceiling is 8 ft high, then 384 cfm will filter 48 sq ft every minute. We get this by dividing 384 by the 8ft ceiling. So, it will clean an area the size of 1,440 square foot every 30 minutes (2 times per hour). It will clean 720 square foot every 15 minutes (4 times per hour). To learn more to make sure the air purifier can clean the square footage of your room, see our Air Purifier Room Size Guide. Note, this is on the highest fan speed. That is how the CADR is measured. What's interesting is that most air purifiers are loud on high. So, in a way it needs to be considered with the noise level of the air purifier. If the air cleaner is so loud that you would never run it on that speed, then it may be meaningless. We recognize this in an issue with air purification in general, so that is one reason why we use bigger filters and better motors. I can't help but point out that the EJ is the quietest air purifier we have seen for this level of air flow. To have better air quality you need this combination of quiet air flow and air filtration efficiency. In summary, we provided information about what allergies are, how they may effect you and what you can do about it. We presented a listing of the top 3 allergy air purifiers. They cover different room sizes and you can watch a video to learn more. We highlighted the connection between asthma and allergies. What causes hay fever, spring allergies and even winter allergies. Much attention was given to how to choose a HEPA air purifier for allergies including the removal of dust. 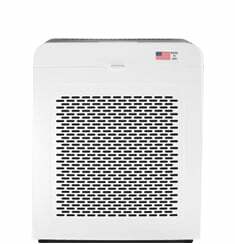 We suggest you go with a true HEPA filter as opposed to a HEPA-type air purifier. What you want to look for is a high filter efficiency, large HEPA filter and a strong motor. The combination of the components will give you quiet air cleaning for the removal of allergens in any sized room. This is what is needed for an effective allergy machine and is most effective for a wide variety of indoor air pollutants. You learned about the CADR (Clean Air Delivery Rate) and how it relates to air cleaning and room size. If you need to remove gases, odors or similar pollutants then a separate activated carbon filter is a must. This is because a true HEPA filter removes particles whereas a gas phase media filter like carbon is for chemical, volatile organic compounds and gas removal. We hope you find this guide helpful and wish you well in feeling better this allergy season. If you have any questions related to air pollution, indoor air quality or allergies in general, please do not hesitate to contact us. We only use US based reps who are knowledgable about allergy air purifiers and how to choose the right air filters. 888-281-3948 (M-F 9-6 EST). Copyright © 2019 Oransi. All Rights Reserved. We can't get over how quiet it is. This is is a high pollen count season so it will be used every day.